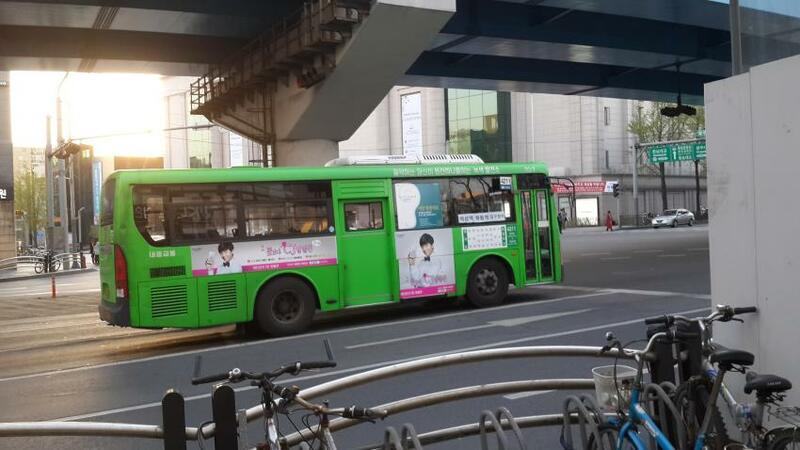 Even though she didn’t catch a glimpse of Seung Gi, she managed to get a photo of his Hello Mobile CF on a public bus passing by the Hyundai Department Store. Think of if as Saks Fifth Avenue or Bloomingdales as the US equivalent. 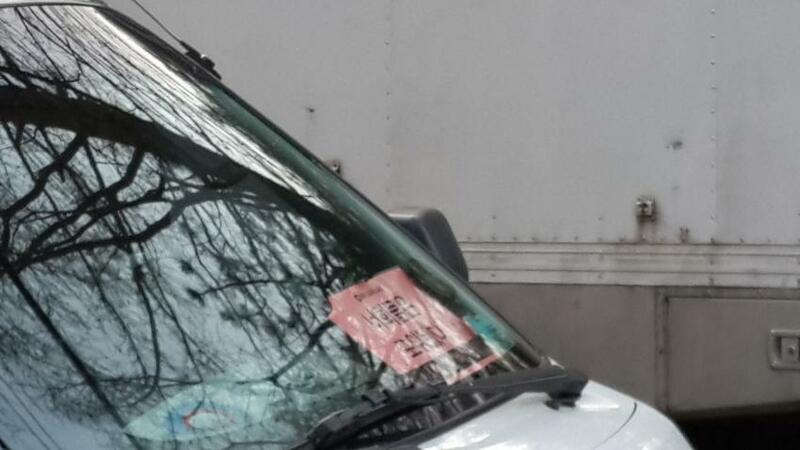 Very high end… The second photo shows the filming van. Categories: CF, dclsg, Department Store, Drama, fanpic, filming, Photos, photoshoot, You Are All Surrounded | Tags: fanpics, filming, Hello Mobile, photo, YAAS | Permalink. 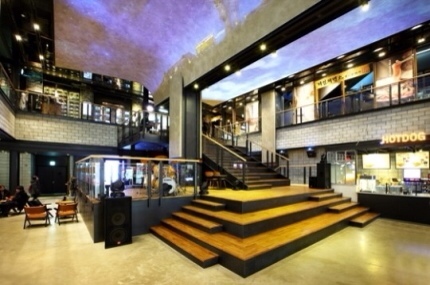 I went to Youngdeungpo Time’s Square VIPS because CJ Square had undergone renovations on the 5th floor. 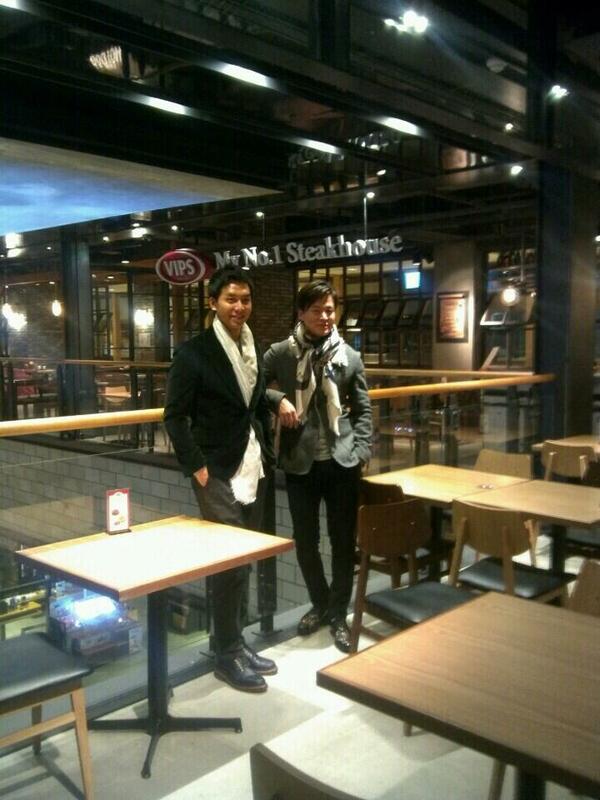 Daebak ㅎㅎㅎ, today Lee Seung Gi and Lee Seojin were there!! Their brilliant aura made the entire VIPS glow!! 영등포 타임스퀘어 5층에 CJ스퀘어로 리뉴얼했길래 거기 빕스 갔는데, 대박ㅎㅎㅎ오늘 이승기랑 이서진 왔었어요!! 후광이 나서 빕스 전체가 번쩍번쩍했음!! 이승기와 이서진 투샷~위메프 광고 보고서야 느꼈는데 둘 분위기가 비슷한듯! 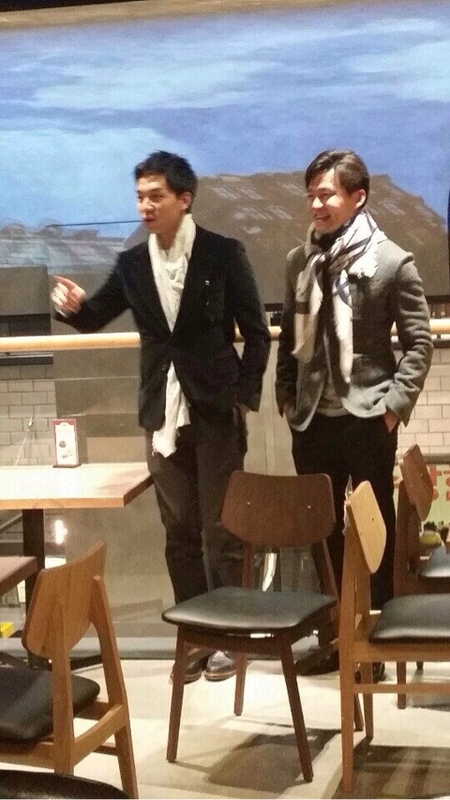 Lee Seung Gi and Lee Seojin two shot~ I felt this as I was watching WeMAP commercials. Both of them are of similar height! 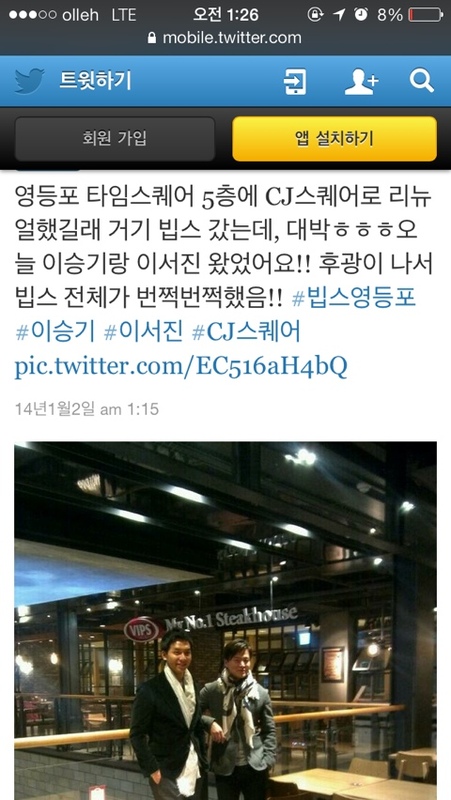 It opened at the end of last year, Lee Seung Gi has also been there. Already, CJ Square has made a rapid climb to a hot place. CJ스퀘어 포함 브랜드로는 영등포 타임스퀘어 4/ 5층에 있는 빕스 제일제면소 투썸 CGV 그리고 지하 1/3층에 있는 올리브영까지! There are many brands at CJ grouped together. This complex cultural center that had a luxurious opening is CJ Square. 지금 사진 보니 기분 좋아보임! Now that I see the photo, he looks like he’s in a good mood! 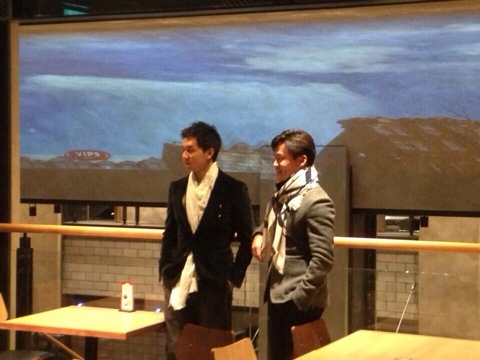 Categories: Department Store, Photos, sighting, translation | Tags: Lee Seo Jin, Lee Seung Gi, VIPS, Youngdeungpo | Permalink. This yellow jacket in Seung Gi’s picture is mentioned in CJ mall’s homepage about how this was the jacket that he wore to film ‘Nunas over Flowers’. Talk about pulling out the stops for publicity! 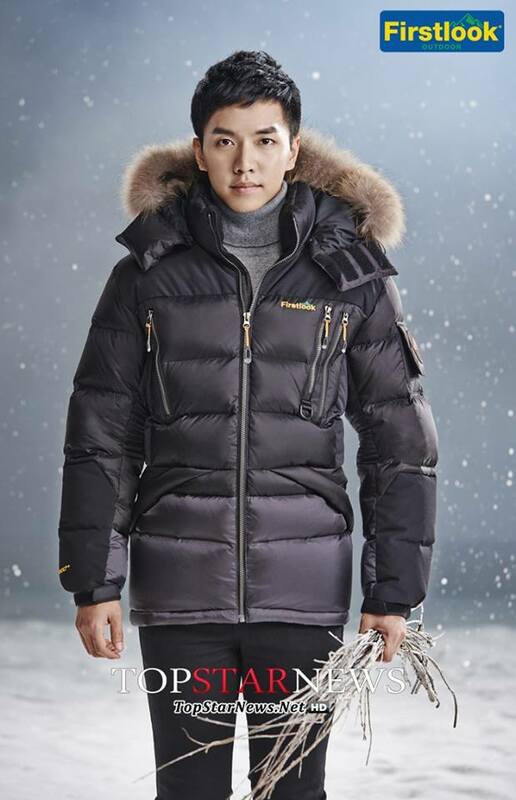 LOL Notice when you click on the link, you’ll see at the very top, Seung Gi wearing this yellow jacket saying “Hot Topic! 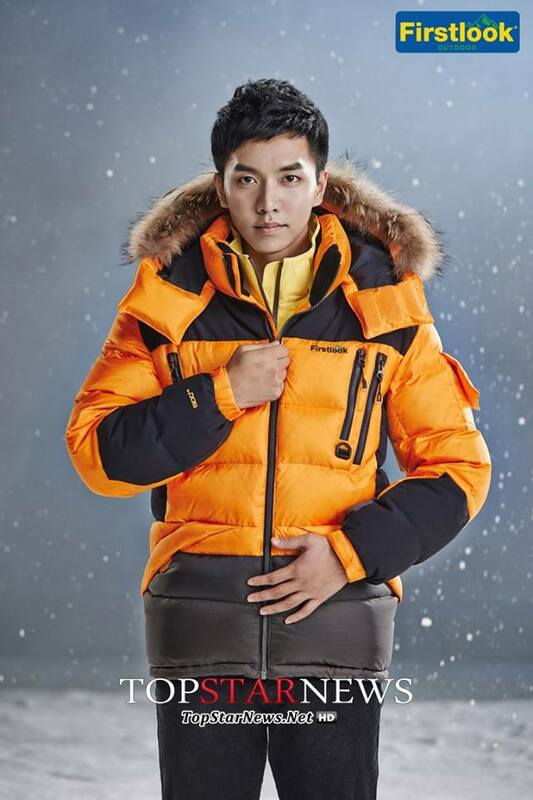 ‘Lee Seung Gi’ Padding” as seen on Nunas over Flowers. You can check it out here: CJ Mall. Categories: CF, Department Store, Event, Photos, Video | Tags: CF, CJ, Firstlook Outdoor, jacket, Nunas Over Flowers | Permalink. This is a Japanese fan’s account from nanako210 on LSG Baidu who translated the Korean version into Chinese and also had a Japanese version. The Japanese and Korean came from a fan’s blog in Japan by a blogger named Maya who knows both Korean and Japanese. nanako210 provided the Japanese fan account from her blog to share with the public so I will post it here, but since it was taken from Maya’s blog, I believe it should be linked back to her blog site. 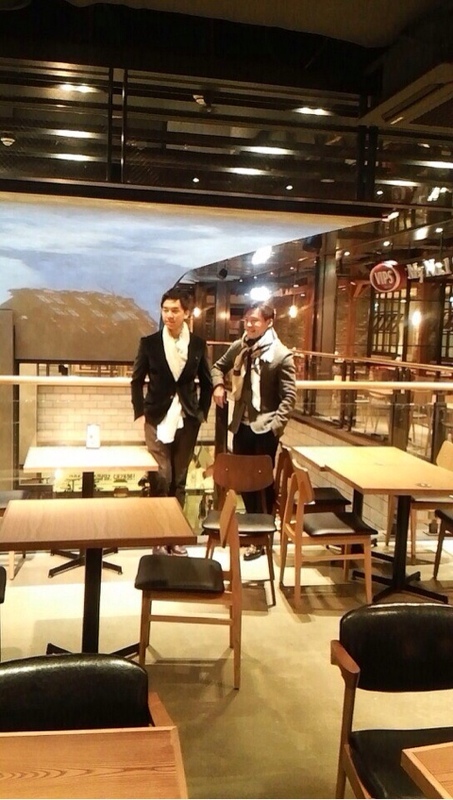 Here’s the link to (まやさん ブログ ) Maya’s blog: Fan account at Heritory fan signing event . I encourage Japanese speakers to visit her site for a full account. Although the Heritory Fan Sign was carried out in the hall of a department store this time, but it seemed that there was a time restriction on the usage of the event location. Hence, the entire fan sign gave people a somewhat rushed kind of feeling. Firstly, other than the fan’s name and Seung Gi’s signature on the autograph card, fans couldn’t request Seung Gi to write any other additional words. As a result, the interaction time with Seung Gi for each and every one of us was truly very, very short, this really made people feel sad and regretful. However, after thinking about it for a while, being able to attend (the fan sign) is already very fortunate, (I) really couldn’t ask for more. When I stood in front of Seung Gi, with my utmost efforts I expressed my heart-felt words to him. 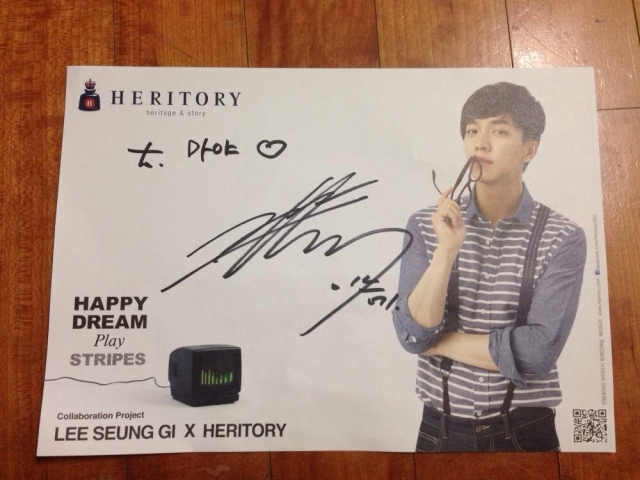 But due to my extreme nervousness, I could only remember Seung Gi’s replies briefly. Me: Do you like vinegar flavored rice wrapped in tofu? SG: Yes, I like it. Me: That’s a relief. During our rehearsal support for the Tokyo performance, we had given you vinegar flavored rice wrapped in tofu. SG: Ah~ yes, yes, you did. Me: But I had been curious whether that was to your liking. SG: It was delicous. Thank you. Me: That’s a relief. Thank you very much. After we finished talking, I shook Seung Gi’s hand, then I left the hall. Although I already knew that Seung Gi probably wouldn’t remember our fan group (Because it’s still not considered as an official established fan group), but among the countless times of fan support for rehearsals, Seung Gi was still able to remember “sushi” this particular matter. Just this could make me feel unlimited happiness. Moreover, I was able to hear his replies with my own ears. For me, this was the most meaningful and best reward from attending the fan sign this time! 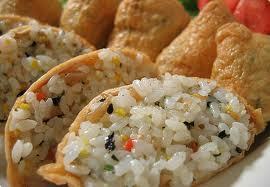 Here are photos of vinegar rice wrapped in tofu. 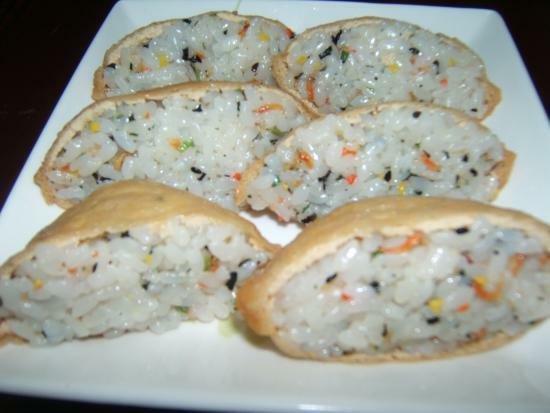 It is called Cho Bap (초밥) in Korean. Categories: Department Store, Event, fan signing, translation | Tags: fan account, fan signing, Heritory, Japanese, translation | Permalink. Categories: Department Store, Event, fan signing, Heritory, Photos | Tags: Bucheon, fan signing, Heritory, Hyundae Department Store | Permalink. In the beginning of this video, you’ll notice that the fans are leaning forward on the table and the security personnel says, “Leaning forward is not allowed”. At 0:55, a fan shouts out “Seung Gi Oppa, you’re good looking!”. Towards the end at 2:10 you’ll see Yoshimoto Banana’s photostorybooks and fans in the background say,”Look at that, don’t you think they’re going to give them out because we’re participating? I don’t think they’re giving them out? Why did they bring them? It might be for the remaining people. Then why did they bring them? Categories: Department Store, Event, fan signing, translation | Tags: Bucheon, fan signing, Heritory, Hyundae Dept. Store | Permalink. Here’s a fancam of Seung Gi’s Heritory fan signing event tonight at the Hyundae Department Store in Bucheon, South Korea. Bucheon is located 1 hr Southwest of Seoul by car. I like the lively BG music for this video because its repeating chorus is “I will love you forever”. Yes we will, Seung Gi!! Here’s a translation of a speech he makes towards the end of the fancam. SG: Yes, thank you. The people in the corridor,you’ve been waiting a long time and you didn’t get an autograph,right? Fan: I also like it (seeing Seung Gi) too! SG: Yes, I like it too. SG: I will probably be leaving for Europe at the end of this month. SG: I will return alive, safe and sound. Also, at the end of this year, I’ll see you at the Seoul Concert. I’ll be preparing for it very much so I ask for your assistance. Thank you. To those fans who have tickets, this year will probably be the best performance ever so I will prepare just as much. Thank you. SG: waves and acknowledges that fan and then turns to wave to fans on the other side. Categories: Department Store, fan signing, Heritory | Tags: イ・スンギ, ヘリトリーファン サイン会, 日本語訳 | Permalink.